When I was a kid trains used to fascinate me. I had a model railroad set, I road on them to visit my grandmother in San Francisco, I lived right next to the tracks in San Jose and would climb the fence and watch them go by; carrying either passengers or cargo, and as a teenager I even hopped a few for the thrill of it. To this day I still can’t help but gaze as they pass by; the powerful locomotives pulling whatever it is they are hauling that day. How much have trains played a role in American Culture? They joined the two halves of our country with the driving of the final stake at Promontory Point in Utah, they’ve played roles in our films; beginning with the old Westerns when the bandits robbed them, to the newer movies such as Batman Begins were the League Of Shadows used one to release their toxic gas into the air. Even Ayn Rand, in her classic novel Atlas Shrugged used Taggart Transcontinental as the last holdout of a dying society beset by governmental control over industry and private lives. 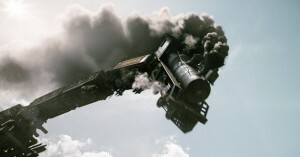 Therefore, it should come as no surprise that I would hop on the band wagon and use a train analogy sooner or later. Let’s for a moment pretend that America is a big train, named Liberty Lines. As long as the conductors of the train keep a steady course the Liberty Line will arrive safely at its destination. But the conductors, (government), of the Liberty Line are out of control, and it is threatening all those aboard. Either we will go off the cliff into tyranny, or we will hit an immovable object; but the end result will remain the same, the destruction of the Liberty Line. Every 4 years, every 2 if you count mid-term elections, we elect new conductors to drive this train, but it makes no difference because the train keeps hurtling down the tracks, heading in the same direction. It matters little the speed at which the train is running; it’s the course it is upon that is important. You see, the rails upon which trains travel are interconnected with many other routes, each controlled by a switch which can either allow the train to proceed on its current path, or divert it onto another track; leading in an entirely new direction. Our country has made so many course changes over the course of its 200+ years of existence that the people on board the train no longer even know the purpose for which they boarded the train in the first place; the preservation of their liberty. The Virginia assembly, motivated by whatever it was that motivated them, chose to ignore Henry’s dire warnings that this new system of government would erode the rights of both the people and the States. They say hindsight is 20/20, and looking back it appears that Patrick Henry, as well as all the other anti-Federalists, were right in their predictions of what would occur should the States ratify the proposed constitution. As I sit here in front of my computer monitor, I am struggling to comprehend how people cannot see what I see so clearly. I just don’t get it; our Constitution is not that hard to understand; so why is it that so few know what it says and how far we have drifted from the principles contained within it? Government in our country, be it federal, state, or local is given its power by consent of the people. Should the people decide that government no longer serves the purpose for which it was established, or if the people simply get tired of having government for that matter, they have the right to withdraw their consent of power and the actions of government become nullities and void. It’s that simple. Government derives its just powers from the consent of the people; go read the Declaration of Independence if you don’t believe me. However, while government exists, it must confine itself to the powers given it by those who created it; if it does not its acts become tyrannical, or at least illegal. After all, the Constitution does say that it is the Supreme Law of the Land. Then why is it that those who serve us in government are not behind bars for violating the laws which govern their actions; yet we as the masters over government find ourselves threatened by all manner of punishment for violating the laws it enacts? Doesn’t that strike you as the least bit odd? Before our government came into existence there were 13 independent and sovereign nations which comprised the United States of America. Each had citizens which recognized their state as their country, with its own system of government to manage the affairs of the State. What has happened, particularly after the loss of the Confederacy in the Civil War, is that the States have lost their sovereignty and the people living within the States no longer see themselves as citizens of the State wherein they reside, but as citizens of the United States with the federal government the provider of all their needs. Look at what happens every time there is a natural disaster of some sort; the States look to the federal government for disaster relief funds to help aid in the recovery from whatever it was that Mother Nature unleashed upon their State. Today our government appropriates money for purposes it was never intended our government have any authority to fund. If you take Madison at his word, that the powers granted government are few and defined, where within the Constitution does it authorize government to require every citizen to participate in Social Security, or provide funds for Medicare? I’ll wait while you check on that, but I can guarantee that you won’t find it. I’ll even give you a hint; the specific powers granted government are found in Article 1, Section 8 of the Constitution. Go look, then get back to me. Our government is more than willing to provide all these funds to the individual States, either for pork projects inserted into Congressional legislation by Congressmen to appease their constituents, or to keep the States dependent upon federal funds for their survival. My home State of California gets 25% of all the money it spends on internal projects from Uncle Sam; and that’s on the lower end of the scale. Mississippi tops the list with 42.9% of all the money it spends on internal projects coming from the federal government. All the other states fall somewhere in between. How does that fit in with what Madison said, “The former will be exercised principally on external objects, as war, peace, negotiation, and foreign commerce; with which last the power of taxation will, for the most part, be connected.”? It doesn’t, that’s how. But nobody seems to care. Everyone gets all exited over the election of a new president when in truth his job is only to enforce the laws Congress enacts. Sure he has veto power, and the authority to select new Justices to the Supreme Court; but it is Congress which makes our laws; it is Congress which is driving the Liberty Line; and Congress is out of control. Yet nobody, at least hardly anybody, pays that much attention to what Congress is doing. If Congress, particularly those claiming to be conservatives, had the spine to stand for what the Constitution says, they could defund every unconstitutional project, agency, and waste of tax dollars. But they don’t have the spine because the people and the States depend upon those precious tax dollars; given to them for things the government was never authorized to do in the first place. Read the following quotes from former presidents and ask yourself if you can imagine anyone in government today saying the same thing. In 1813 James Madison vetoed a bill for internal improvements in the U.S., stating, “Having considered the bill this day presented to me entitled “An act to set apart and pledge certain funds for internal improvements,” and which sets apart and pledges funds “for constructing roads and canals, and improving the navigation of water courses, in order to facilitate, promote, and give security to internal commerce among the several States, and to render more easy and less expensive the means and provisions for the common defense,” I am constrained by the insuperable difficulty I feel in reconciling the bill with the Constitution of the United States to return it with that objection to the House of Representatives, in which it originated. Yet that is why most people vote for a particular candidate today; based upon the promise to do things which they feel are best for them, or the country. Me; I only want government off my back and out of my life. After all, isn’t that what liberty is all about? In 1964, when Barry Goldwater was running for president, he said, “A government big enough to give you everything you want, is a government big enough to take away everything that you have.” That quote is often attributed to Thomas Jefferson, when in truth it is not found amongst the writings of Jefferson anywhere. Yet just because Jefferson didn’t say it doesn’t make it any less true. Do you think drug dealers want addicts to get clean, get sober? No, their existence depends upon people remaining addicted to the poisons they sell. The same goes for government; it does not want a free and independent people, because if the people ever become self-reliant and independent they will no longer need government, and may come to see it as the evil that it is. Therefore, if evil is to exist in the form of government, wouldn’t it be best if that evil was as unobtrusive as possible? Instead, today we not only tolerate governmental interference and control over our lives, we clamor for it to keep us safe from all manner of threats. Terror, crime, gun violence, you name it; Big Brother government is there to provide an answer. Really, is that the nature of free men; looking to government for all their answers. Or does freedom today only mean the choice of what clothes to wear, what food to eat, and what to watch on TV? I feel like some guy standing by the tracks screaming at the passengers aboard the train to wake up, only to watch as the train speeds by, the people aboard oblivious to my warnings. It’s both frustrating and heartbreaking, but such is the story of my life these days.